Rangetsu of Tokyo is a Japanese restaurant located in Maitland, FL. These pictures were sent in by TM. He writes: "Rangetsu / Orchid Lounge is a restaurant featuring excellent Japanese cuisine including sushi and sukiyaki, which is cooked right at the table. They were formerly located on International Drive and also featured some kinda weird dishes aimed at tourists, including fried alligator meat." TM continues: "I know the site policy is that no other fixtures shall be featured, but I kinda... cheated to get the vanity and urinals in a shot using the mirror... 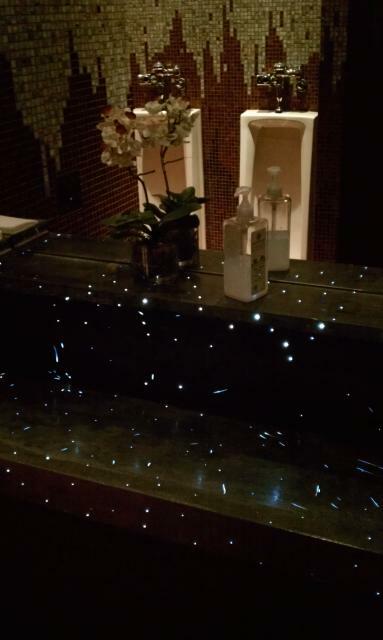 The bathroom sink is kind of neat, it's a trough structure with an overhanging lip that has a waterfall style faucet that comes on when you stand next to it, and the entire sink is made of some kind of concrete with embedded fiberoptic materials and LED lighting -- IT GLOWS! 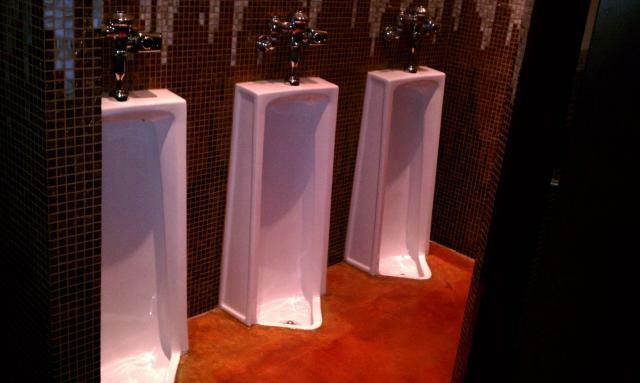 Shame the urinals don't. :)"